Help score a touchdown for your local food pantry at the Avon vs. Avon Lake Varsity Football Game. On September 7, 2018 the SOUPer Bowl Food Drive to benefit Community Resource Services (CRS) was held. This annual food drive is a friendly competition between Avon and Avon Lake. Congratulations to Avon for winning this year’s SOUPer Bowl, although the real winner is CRS and the families that we serve in Avon and Avon Lake. The generosity of students, staff and community members from both Avon and Avon Lake was overwhelming. Both communities together donated $9,978 and 6,953 pounds of food. 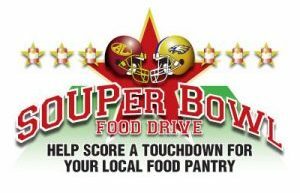 Since its inception in 2010, the SOUPer Bowl Food Drive has raised a total of 57,519 pounds of food and $99,539 in monetary donations! Special thanks to the following individuals, businesses and organizations for their support of the food drive: Kristina Buller, Kris Simecek, Avon High School Athletic Booster Club, Avon High School Student Council, Avon Lake High School Student Council, Learwood Middle School, Mexichem Specialty Resins, Oxy Vinyls LP, Sue Cole from the Avon Lake Transportation Department, Jim Blodgett from the Avon Transportation Department, the staff, students and families at all of the schools in both Avon and Avon Lake and all of the individuals who volunteered their time or made donations to ensure the success of this event!